Located just past the main entrance to Zion National Park north of the town of Springdale, the Visitor Center is the first destination for most tourists entering the park and is also the starting point for the shuttle bus system that takes visitors up Zion Canyon. 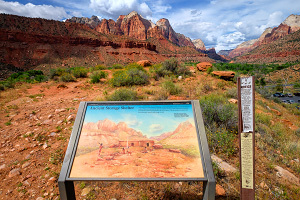 While many people know of the more popular trails nearby, the Pa'rus Trail and the Watchman Trail, the Visitor Center is also home to a pair of lesser-known strolls: the Archeology Trail and the Virgin River Nature Trail. Both are very short walks that just about anybody can enjoy in a matter of minutes. For more information, please see Brian Forist's wonderful article, Twelve Great Things About the Archeology Trail. Behind the Visitor Center near the restrooms building is a very short little paved path known as the Virgin River Nature Trail. 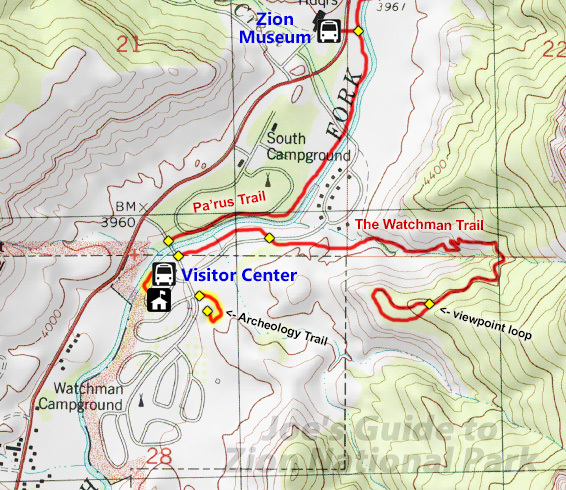 While this might not be the most exciting walk in the park, this path is wheelchair accessible and is suitable for those who want a taste of Zion but can only walk short distances. This trail also provides convenient access to the Virgin River where people may want to relax and dip their feet.